You'll be £25.00 closer to your next £10.00 credit when you purchase Defending the Ypres Front 1914 - 1918. What's this? 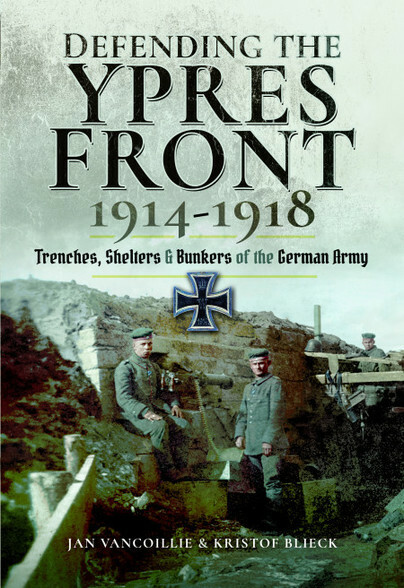 Published by the Memorial Museum Passchendaele in 2016 in Dutch as Bouwen aan het front, this book examines how the German army developed field fortifications to hold what can loosely be described as the Ypres Front. With the decision by Falkenhayn in 1915 to concentrate Germany’s offensive efforts largely in the east, the German defenders around Ypres set to developing their lines for semi-permanent occupation. The sub soil around the Salient generally made it difficult to construct and maintain mined (i.e. deep) dugouts - unlike on, for example the Somme, with easily worked chalk not far below the surface. The only practicable alternative was to use reinforced concrete. In this book the authors (both with many years of experience in researching and working on matters Great War, particularly the German army in Belgium) have examined in detail an impressive range of primary sources to provide a narrative of what the Germans built, how they built it (the logistical challenge was enormous) and how the designs and requirements of bunkers (for example, forward medical bunkers, artillery shelters, machine gun and observation bunkers) changed as the war progressed and as the military situation on the front dictated. There are many photographs, largely unseen by British readers, design diagrams and maps to supplement the text; whilst the activities of selected particular formations are examined in detail to provide an example of the effort that was put into the work. Additions to the Dutch edition will include a tours section, taking a visitor to accessible remaining structures in the Salient area; and a glossary of terms and their English equivalent. The book will be in full colour throughout. In outline this comprehensive book describes the German structures employed to defend the territory captured around Ypres and makes excellent use of official drawings and maps as well as photographs from the authors' collections. The many photographs are fascinating. As acknowledged experts - and with Nigel Cave's editing involvement and a decent translation from the original - the author leaves little to say about the subject and have delivered a readable book. Overall this work provides the reader, whether military history buff or not, with a clear insight into just how ‘tough a nut’ the German line was for the Allies to crack in 1918. Its place on our library shelves is well deserved. The book is complimented by fantastic photographs, diagrams and support text detailing the various aspect of these constructions. Many of these have not been seen in Britain before. A tremendous resource for anyone interested in the Western Front, and also a complementary on the ground book to use if you are visiting the area. The English-language edition has added to their work to include a tours section that takes the visitor to accessible remaining structures in the Salient area, with a glossary of German terms and their English equivalents... There is extensive illustration of the highest quality. This is something outside of the norm and well recommended.